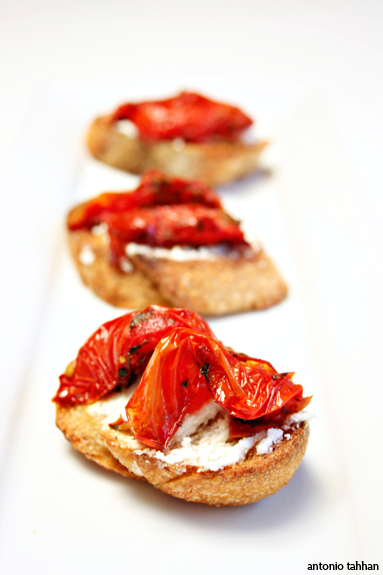 Posted in appetizers, French, Italian, recipe, savory by Antonio Tahhan on May 3rd, 2009. You can follow any responses to this entry through the RSS 2.0 feed. You can leave a response, or trackback from your own site. 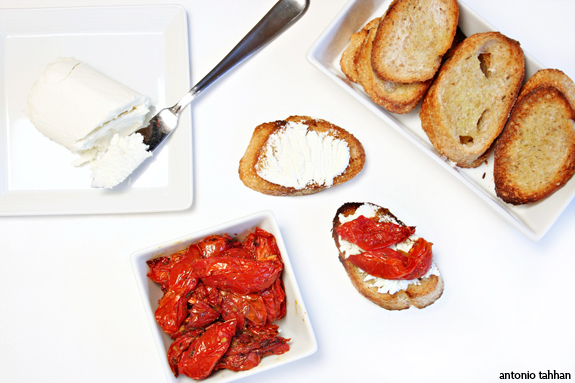 This looks so summery and easy Antonio…love the crostini with the goats cheese too! As soon as I saw your title in my reader, I knew exactly what recipe this would be! I am so glad you chose it because I have been dying to try it myself, it looks so delicious. I won something?! Yay, I didn’t even know I was in a contest. 🙂 I am so excited! Wow, I love your photography and how you lay out and mark the ingredients. Great idea! I may have to steal that. I really have to buy her book. You have beautiful photos. Looks so delicious. WOW, what a fantastic site! I love this book, I have been devouring it (I know, an overused expression I’m sure) all week. This was one of the first recipes on my to-make list! 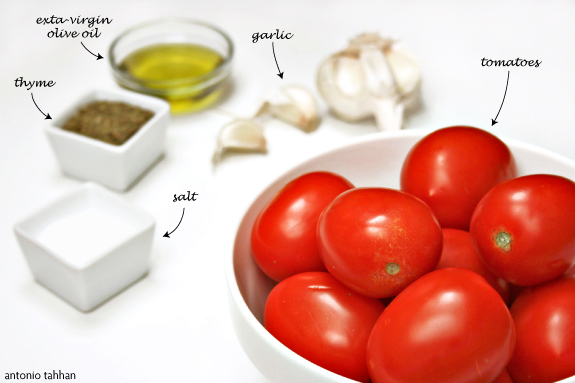 Such a simple yet incredibly tasty-looking recipe… Must try this when tomatoes are at their peak. Oh wow, I can’t believe I won! How very exciting, I’m going to start brainstorming ways to use this new ingredient right now! I’ve made that recipe so many times. It is a huge crowd pleaser. I love having them on hand. 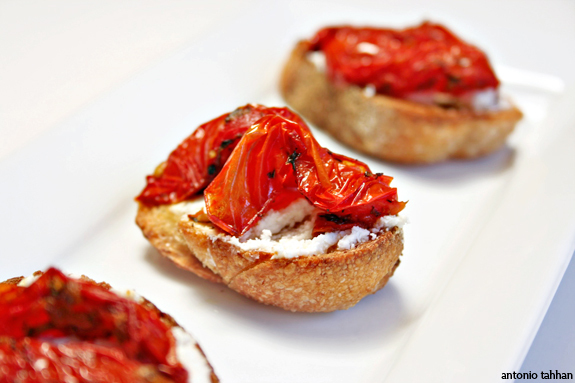 Tony, I can taste the concentrated tomatoes now and the tart cheese is the perfect foil for sweet, sweet tomatoes. Hey Tony …you’re lost ! N aye aye …bad day you had there ..sorry about that, but these tomatoes more than make up for anything. Slow roasting ’em for 6 hrs … divine ! 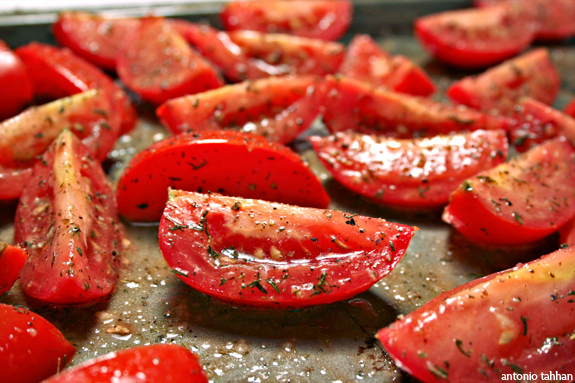 Wow, I can almost imagine the fragrance of the roasted tomatoes after 6 to 7 hours! Yum yum yum! Waw I will try this recipe ,it’s so easy and simple.Good presentation. Sadly tomatoes are a thing of the past as we are rapidly approaching winter in Melbourne! Nice to have discovered your blog – your photos are gorgeous! I’m reading Molly’s books and loving it! I haven’t reached the part about these tomatoes and now I can’t wait till I get there. These look absolutely delicious and seems like with something as delicious as this, there are endless possibilities! I love the idea. great photos as well. I will try that instantly. now it is full of fresh, ripe tomatoes here and goat cheese should not be a problem as well.